Because no gaming platform is complete without Capcom-brand fisticuffs, the beloved publisher has added two of its biggest classic hits to Apple's various gadgets. For the most part, both games are pretty standard ports of Final Fight and the various incarnations of Street Fighter II, however, they each include a few iOS-exclusive additions. Legendary beat-'em-up action game Final Fight is now available on the App Store. Play as one of three characters (Guy, Cody or Haggar) who must rescue a kidnapped young woman named Jessica from a ruthless street gang. Each character has his own fighting style and abilities and the iOS version also includes a handy finishing move button which allows the player to blow up enemies when in danger. Two players can team up for co-op gameplay via Bluetooth network support. Street Fighter II Collection includes three of the original and renowned fighting games from the franchise together in one app: Street Fighter II, Street Fighter II: Champion Edition and Street Fighter II: Hyper Fighting. Players can relive the epic fighting action of these classic games with tailored features for iOS - an easy-to-use one button finishing move and competitive network play via Bluetooth support. The Street Fighter II Collection sports a $4 price tag on Apple's App Store, and though Final Fight normally would set you back $3, if you purchase the game by September 21 -- my birthday *nudge nudge* -- you can own the arcade classic for a single dollar. Alright, now that I've got all the positive bits out of the way, can I finally stop ignoring the huge, angry elephant standing in the middle of the room? How can you possibly play Street Fighter II on an iPhone? Yes, it's very kind of Capcom to give the iOS iteration a few simplified control options, but even assuming that they work as they should, doesn't that remove a huge chunk of the game's inherent appeal? 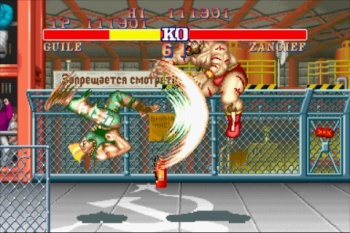 Or do iPhone gamers just want to tap various parts of the screen while Zangief launches into a string of 720-degree piledrivers? Don't get me wrong, there's nothing I like more than that big, fuzzy Russian grinding a tiny Chinese girl into the hard metal floor of a Soviet ironworks, but without the challenge of precisely timing a full joystick circle, I just don't know that it would have the same visceral appeal as it did in the arcades. I'm obviously still going to buy the game because I have absolutely no willpower when it comes to Capcom's fighting games, but I'm also going to send Capcom's PR team an email full of frowny emoticons. Take THAT you corporate fatcats!